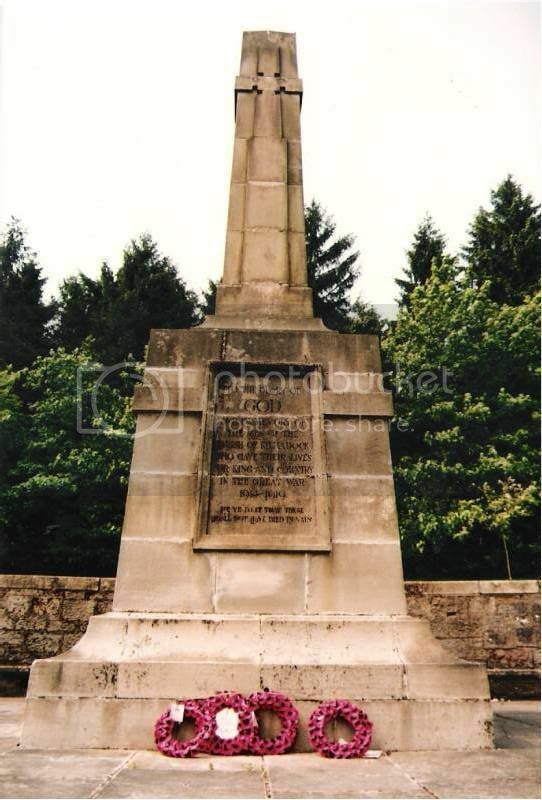 The Doune war memorial is a freestone cenotaph with a cross in relief on the face. 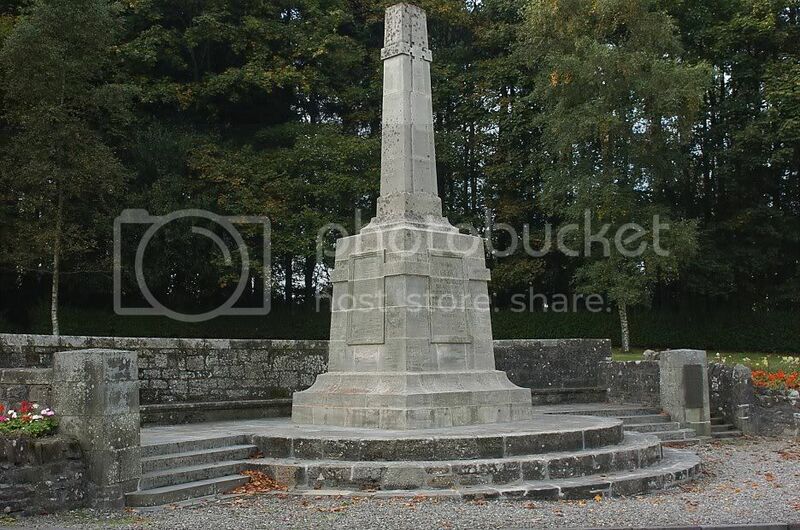 The tall pedestal rests on three circular steps. A low wall runs along the back and both sides of the site which is terraced with a series of low steps. The commemoration and names of the dead are carved in stone tablets set into the faces of the pedestal. 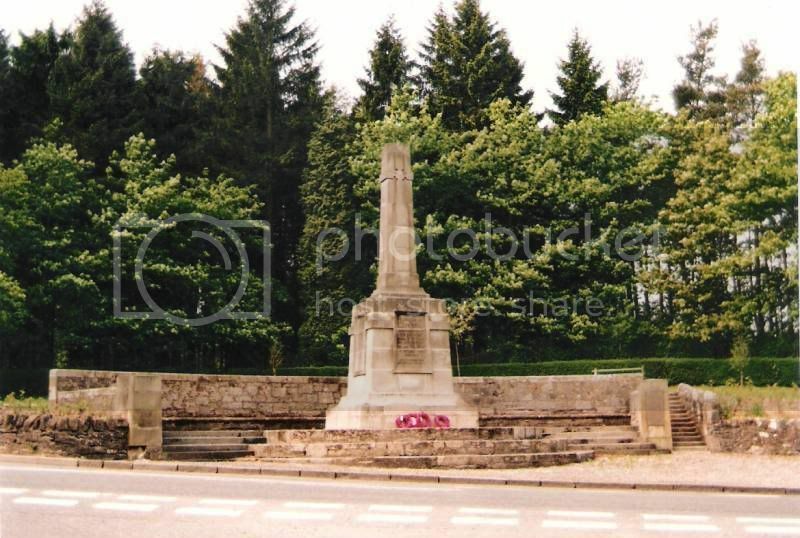 The monument stands on Callander Road. The tablets were badly weathered when these photographs were taken in the 1990's. I don't know if they have been restored and I don't have a transcription yet. 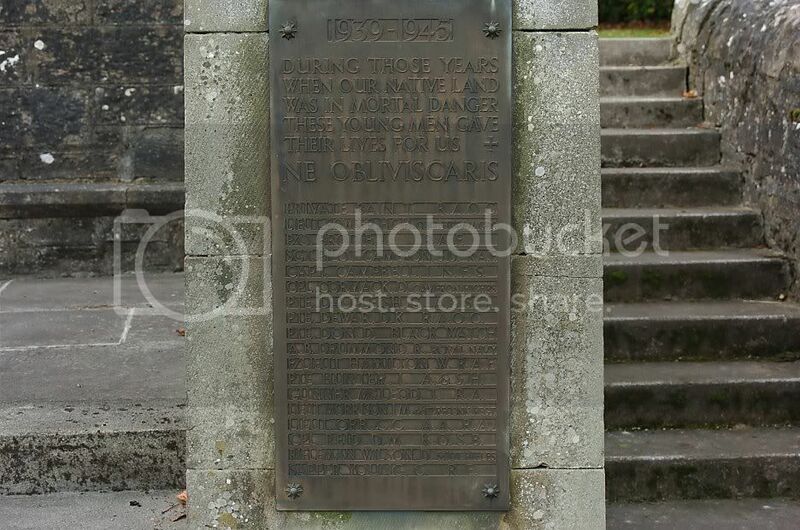 As Jim mentioned in his post I wonder if this memorial has been refurbished ? The WWII memorial plaque is attached to the wall at the right of the main WWI memorial. Posted: Wed Oct 07, 2009 11:16 pm Post subject: Early days. Good post. 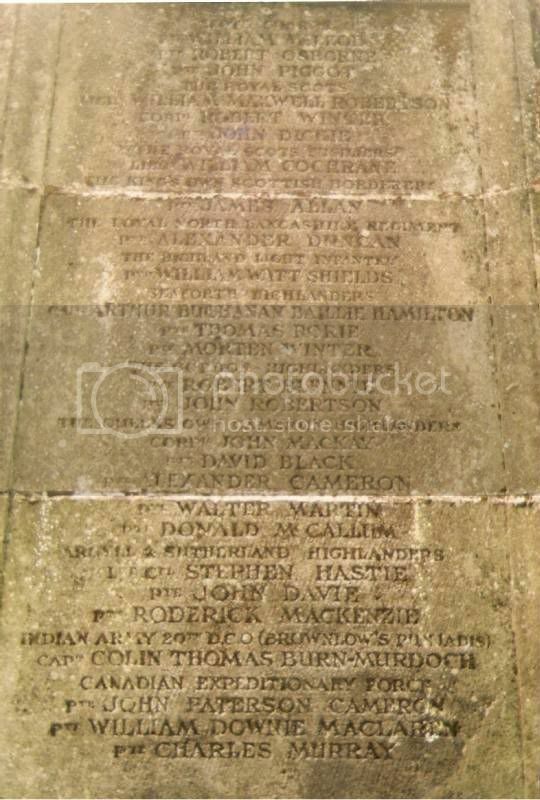 Interesting to see how they have listed the men on the memorial. In this style it would, usually, be alphabetical. If you count down the names of the Deanston men James Stewart is number 28! Are they perhaps listed in chronological order of deaths? 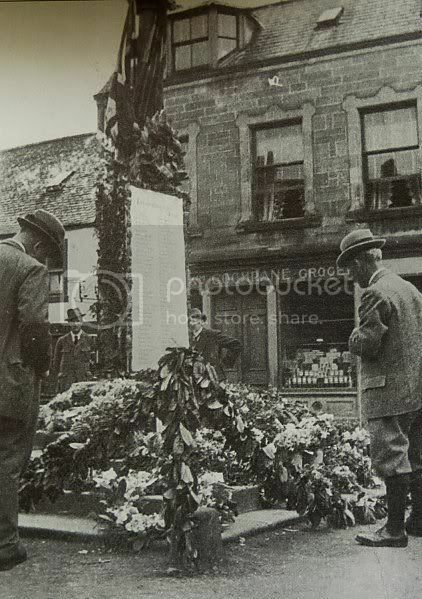 Lady Muir & Sir A. K. Muir were great benefactors to the area and following much debate and controversy in Doune as to whether the fallen should be remembered by the erection of a memorial or a public hall they donated the Muir Hall to the village in the same year as the war memorial was unveiled. 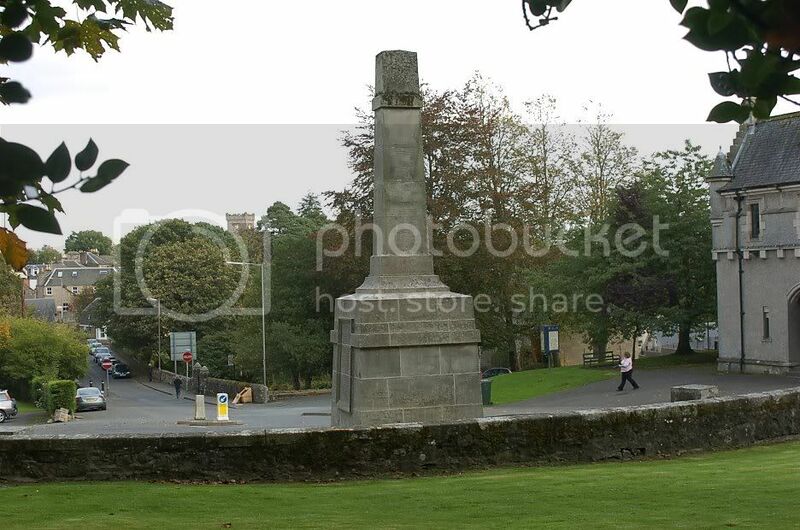 They also donated an impressive clock to the village of Deanston around the same time. I will post a photo of the memorial and Muir Hall shortly. 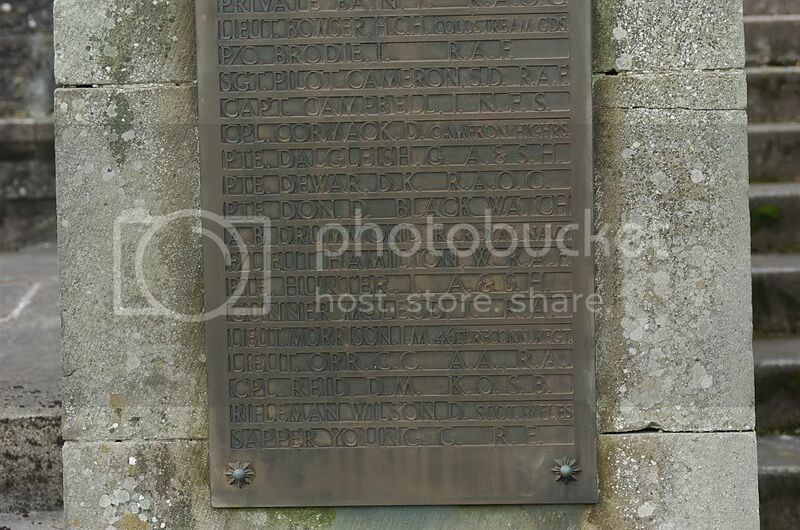 There is certainly a James Stewart listed on this memorial but he is a private. The one I mentioned in the query re. 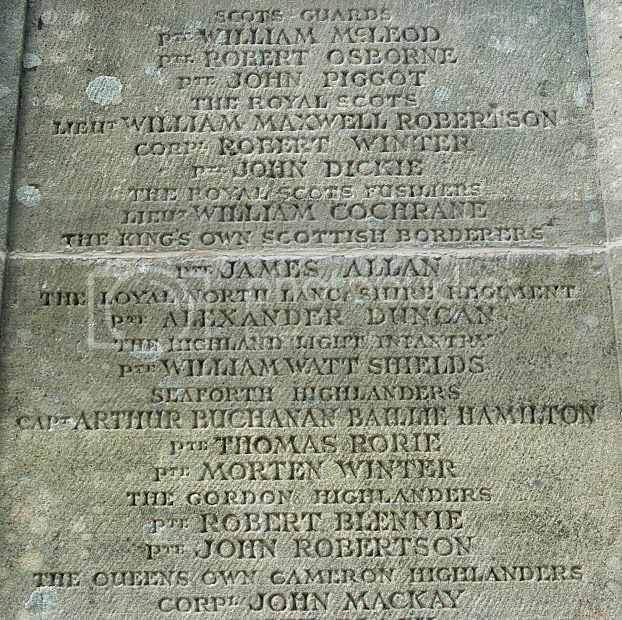 Lady Muir's Shrine is a second lieutenant - different casualties. However your theory could be correct for the names on the old mill. Will have to look at that. 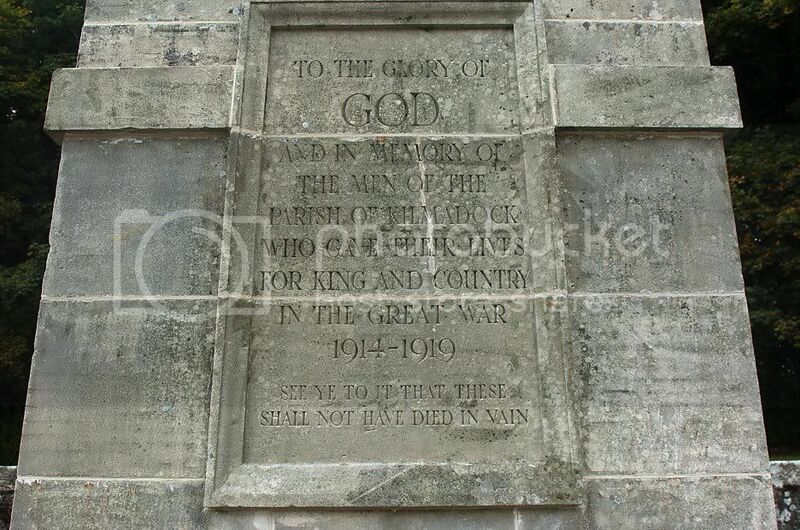 I believe the memorial was going to be renovated as it was falling into a state of disrepair. I see its had a clean up - is that it or will more remedial work be done ? The main monument has obviously been repointed as has the foundations but the surrounding walls etc have largely been left alone with the odd crack filled. I assume that is 'job done' but at some point in the near future the names on one side at least would require to be re-engraved. 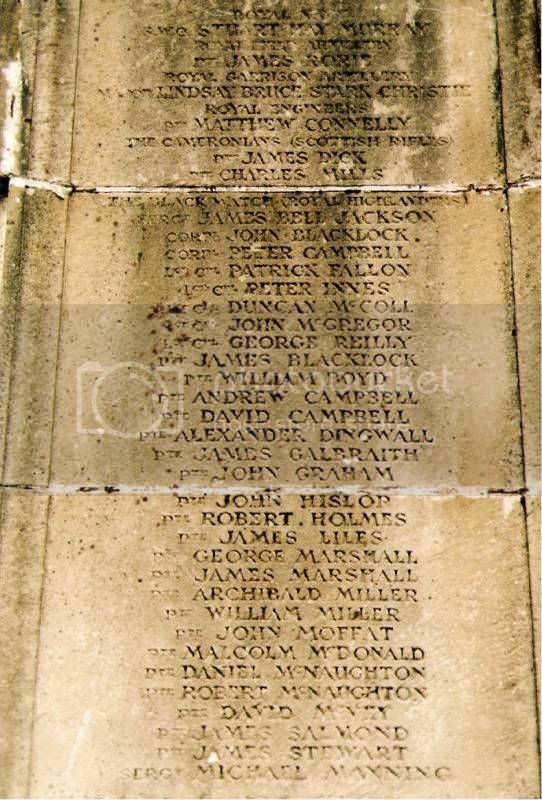 Also listed on the Merchiston Castle School War Memorial, Edinburgh. 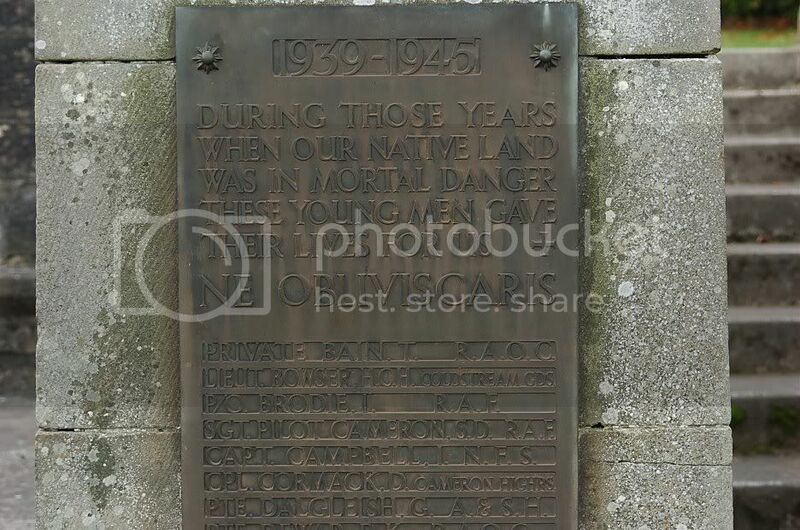 Posted: Mon Apr 27, 2015 8:05 pm Post subject: WW1 - Pte. John Paterson Cameron, Canadians. The Glasgow Herald, Saturday, 29th. 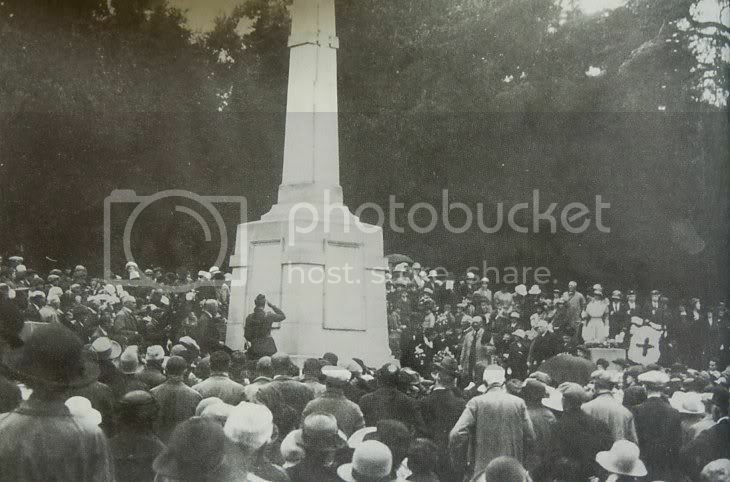 June, 1918. 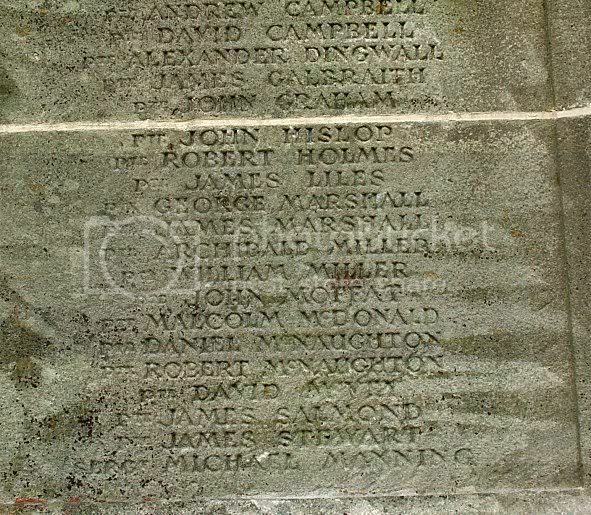 CAMERON.- Previously reported wounded and missing on 31st October, 1917, now officially presumed to have died on or since that date, Pte. 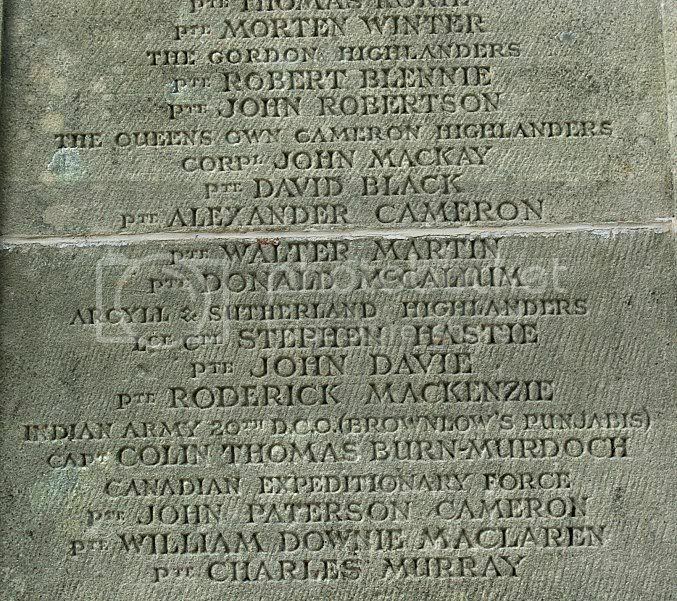 John Paterson, Pioneer Batt., Canadians, second son of the late John Cameron of Loudounhill, Ayrshire, and late of Kames, Doune." Date of Death: 31/10/1917. Age: 31. Regiment/Service: Canadian Pioneers "B" Coy. 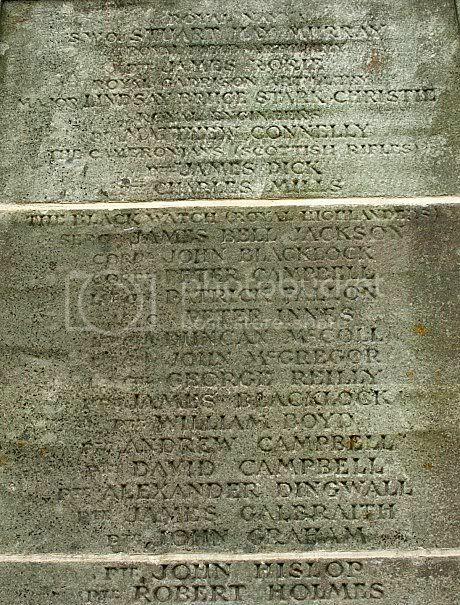 Additional Information: Son of the late Mr. and Mrs. John Cameron, of Loudounhill, Darvel, Ayrshire, Scotland. 1901 Census Perthshire, Kilmadock, Kames, recorded (transcription):- John Cameron (14), Scholar, son, born Ayrshire, Loudoun; John Cameron (57), Farmer, born Loudoun; Catherine Cameron (51), Wife, born Lanarks., East Kilbride; siblings. 1891 Census - family recorded living at Loudounhill, Ayrshire.